Here are five stories typical of the Usagi stable. Only the first features characters we know. There is slightly less of an overt history lesson in this volume. Although we do learn of the politics of marriage and receive a tiny glimpse into the world beyond Japan. Plus the art of Suiseki – stone appreciation. There is nothing wrong with the stories but we have been treated to such high standards that these solid tales don’t really stand out amongst all the other gems. But there is a certain character you hope to see again. This is a storyline set 15 years in the future of the Usagi Continuity and it is based around the idea of a Martian invasion. The Martians are the same ones H.G Wells created and their plan is as described in his book the War of the Worlds. Being set outside traditional canon Sakai gathers as many characters as he can to guest star in this epic volume. He gets to resolve events we never thought we would see yet it does not spoil the current continuity. It also means he can make the invasion a deadly one. Lots of popular named characters die. If this was the last ever volume you would be stunned and heartbroken but as everyone is still alive in the current timeline you aren’t traumatised. This is either the best or worst of both worlds. Sakai’s re-interpretation of this story is great with the aliens being compared to Tako (Octopi) and the Tripods called Three-Walkers. These fit right in with the period anthropomorphic nature of the Usagi world and everything feels highly integrated – unlike Space Usagi. However there are a few Godzilla inspired moments which give you a great laugh. It is an excellent hardcover that is a joy to hold and read. There are the wraparound covers from the single issues that show you what a master of composition Sakai is and there is an Usagi/ Stan mini strip that explains the origins of the story. There are also details of some elements that were updated for the collected edition revealing just how much of a perfectionist he is. If you have forgotten Jizo is the deity who looks after children and those suffering hardship. We learnt about him and the statues used in his worship in the volume Shades of Death. We also get to find out how Soy Sauce is made, how xenophobia affects art, what an ice runner is and much more in this education-tastic volume. Inspector Ishida returns and we get a great mystery to solve which isn’t too obscure or too easy. The repercussions of this flow into the titular 200 Jizo story. It is great to see everything connected. Some of the stories are just a single issue. Whilst the Artist raises cultural questions Buntori seems like filler which is rare for an Usagi tale. The art is great and shows just how much you can achieve with simple line drawings of animals. The expressions are so emotive and when the lines thicken to show anger it is dramatically effective. There are also some nocturnal scenes allowing Sakai to use impressive lighting effects. There are a lot of extras including mock interviews with Usagi, historical explanations, the creation of an unpublished story and the usual cover gallery. The introduction is by comics artist Guy Davis. Although it is not one of the great storyline volumes of the early Usagi era these four tales exemplify samurai high drama perfectly. 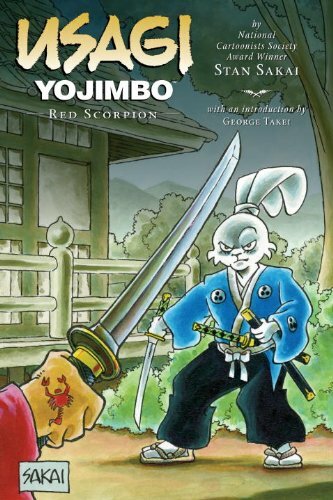 They are a wonderful blend and distillation of authentic Japanese culture and folklore, the values of bushido, personal courage, and sacrifice portrayed in themes we can all deeply identify with. 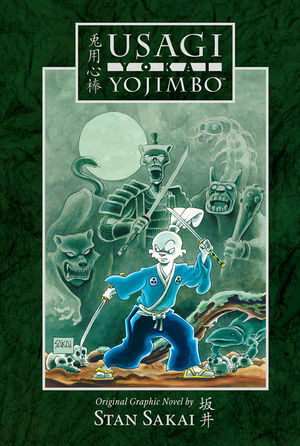 The Introduction by actor George Takei pinpoints the spirit of Robin Hood, or the Lone Ranger as being instrumental in the appeal and success of Usagi Yojimbo. These are standalone tales, although I suspect we may see the titular Red Scorpion in future. Having said that the Lord of Owls and Kitsune & Kiyoko appear giving us some great dialogue. The background notes tell us all about Toad Oil, Owls and Seppuku, ensuring we are a little more enlightened after our enthralling read. The art is superb. Despite being animals their faces are mesmerizingly expressive conveying sincere and dramatic emotions. The fight scenes so integral to samurai drama flow effortlessly just as a master swordsman. Sakai also knows when to focus on the little details. A sandal, a rock or a hand in close-up tells us more than a tiny frame should and there is a hysterical moment where Usagi is bouncing up and down in the frame and you have to work out why. 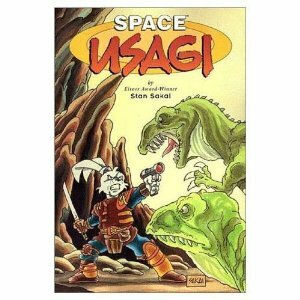 Here is another superb helping of Usagi action with six stories that don’t need any prior reading. 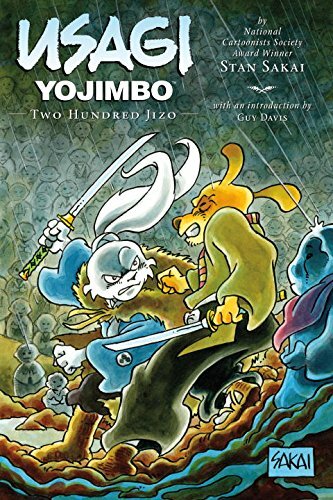 There is a wonderful three part tale that opens and closes this volume which has all the elements of Samurai drama plus loads of great fight scenes. It’s a two man Seven Samurai. There are other tales that allow Usagi to show off his skill, his wisdom, his compassion, and teach us a few more aspects of Japanese culture and folklore. The art is great and the black and white style really focusses your attention on what is going on. The expressions are terrific and really contribute to the voices you conjure to speak the dialogue. There is a cover gallery at the back. The comics world is rife with team-ups, crossovers and alternate universe stories. They rarely add to the glory of the originals and come across as a cheap cash in. 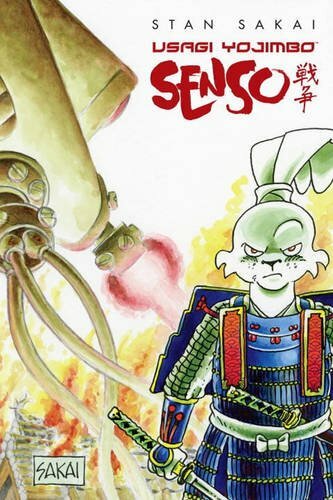 This volume sees a descendent of the original Miyamoto Usagi in a science fiction setting. 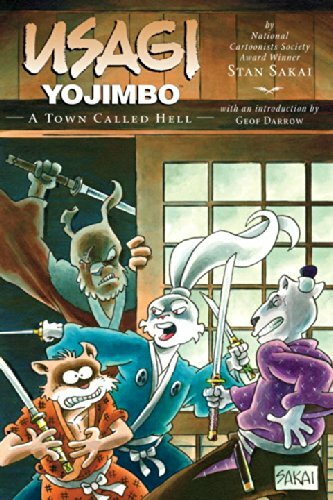 There are three long and two short stories making this the longest volume in the Usagi series. Despite the limitless potential of science fiction the whole thing starts off as a Star Wars copy. The character archetypes, the setting, the plot, even lines of dialogue. You aren’t sure if this is homage, parody or lazy writing. This is quite a shock as Stan Sakai stories have always been highly original and unpredictable. The third story does manage to break away from this poor start and the two short stories have the trademark bittersweet ending of Eastern storytelling. Despite an incredible injection of emotion and characterisation in the third story it is not the exceptional fiction of the previous volumes. It is interesting to see how your favourite characters translate to a future setting however. In terms of laughs and curiosity value though this is not a volume to be missed. It is like going to a fancy dress party with all your mates. The people are same but dressed differently and you will probably have a good time. It’s not Usagi but it still manages a Thumbs Up! 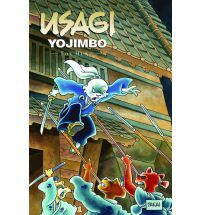 This volume sees seven stories from Usagi’s life. The first is a humorous tale from his studies with Sensei Katsuichi followed by a two page scene from his travels with Jotaro. Then come five longer tales from unnamed periods of his warrior pilgrimage. They all sit together quite seamlessly and convey the broad spectrum of samurai themes from demon hunting to duty beyond death. Some minor characters appear in the third story and are used appropriately, but for the rest Usagi is on his own. There is a rich blend of action and thoughtfulness. The art is great and seems to have more spice than usual. Two-third length double page spreads are Stan’s new toy. These and a true double page spread really give you a visual jolt that you aren’t used to, but is most welcome. There are extreme close-ups and extreme longshots, a little bleed between panels, some excellent perspective and really dramatic poses and lighting. There is a fantastic sequence of an object arcing through the air that is a real work of art – simple and elegant. Even the lettering gets a little jazz when it comes to some magic words. All these techniques are used intelligently to advance the story but you get the feeling there is a lot more to Stan’s greatness than you get to see. 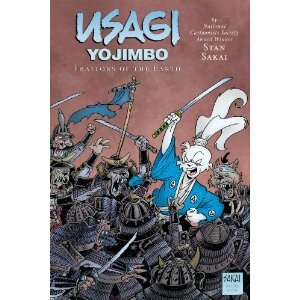 There is a cover gallery, a Groo Vs. Usagi Comic Con strip, and introduction by Walter Simonson. This volume is dedicated to Stan Lee. Thumbs Up! Many of the previous volumes have dealt with serious events, dramatic revelations and intense characterisation. This volume takes a step back and the many tales here are lighter in tone. Many of them have a certain humour to them, often black humour, and like many traditional oriental tales the ending is fitting but seldom happy. As the world shattering events have been put on hold there is an opportunity for more instructional tales as we learn more about Bushido and about humanity. Gen in particular is at his most compassionate and we get that rare glimpse into his heart of gold. Usagi on the other hand becomes more wayward having little respect for the law or for the Shogunate. The pace slows right down and with no imminent danger we are able to see the beauty of the wonderful country Usagi travels through, the character of its people, and learn more of the nature of the heroes we have been following for longer than we can remember. This won’t be the most memorable volume you will read but it is one of the most perfectly told. The timeless tales within are the epitome of “the less is more” adage. It is unquestionably a Thumbs Up!